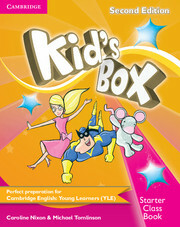 Loved by children and teachers the world over, Kid’s Box is bursting with bright ideas to inspire you and your pupils. Perfect for general use, it also fully covers the Cambridge English: Young Learners (YLE) tests syllabus, preparing students better than ever for success at Starters, Movers and Flyers. Get an eSample of Kid's Box Second Edition that will allow you to view a product preview on your desktop. Well-loved by children and teachers the world over, Kid’s Box is bursting with bright ideas to inspire you and your pupils. Perfect for general use, the course also fully covers the syllabus of the Cambridge Young Learners English (YLE) tests, preparing your students better than ever for success at Starters, Movers and Flyers. The new edition offers enhanced digital support including a new Presentation Plus with interactive whiteboard tools, interactive Pupil’s and Activity Books, extra teacher's resources and online teacher training. The online platform includes games and extra activities for every unit, and all the students' online work can be tracked and reviewed by the teacher. Whether using a computer or tablet, you can find all your digital resources in one easy place. Meet the Second Edition authors and find out more about them. Looking for a special version of Kid's Box First Edition? Click below to see what we have available.